This shiny little treasure was acquired by my two friends, Brenda and Jen, and I early yesterday morning, when we realized in a desperate moment that the strainer we thought we’d be able to borrow to can applesauce–yes, applesauce–was suddenly unavailable. (Victorian Strainers are not easy to come by. Believe me.) So in a flash of inspiration, my two galpals made a frantic run to TruValue Hardware in search of the elusive tool. Happily, they found it…but with an accompanying price tag of eighty-five dollars. Would you believe we didn’t blink before purchasing it? Good thing there were three of us to split the bill. We quickly constructed a verbal contract according to which we each now own 33.3% of our very own Victorian Strainer, and will divide usage of said strainer accordingly. Storage is to be determined, although Brenda is currently in the lead because her garage is cleaner than my front room. See, everybody…my husband’s not the only one with business partners and backroom deals. So he develops properties and engineers dams? Big deal. I can my own applesauce. This obviously does not include canning. But something has felt different this fall. I don’t know if it’s because summer whizzed by so quickly or I’m losing my faculties living with my parents, but the word canning just seems to be crackling in air like a fallen maple leaf crunching underfoot. I read about it on the blogs. I hear whispers of it in the halls at church. I catch snatches of hushed conversations about food preservation at important meetings, in spacious libraries, at fine restaurants, in upscale movie theaters. Everywhere I turn, news of the fresh crop of peaches, pears, and apples is thrown in my face as though Mother Earth has a whipped up a guilt pie and I am standing in the booth at the school carnival. We had approximately nineteen young children underfoot while we worked, which added to the quaint white-trashiness of the entire experience. The house was loud and warm and smelled headily of cooked apples, which hopefully made up for the disaster that ensued. (Sorry, Brenda.) We thought we’d be done by noon yesterday, which of course meant that we were still working at five last night and spent four more hours finishing up today. So on our evening walk last night, I jauntily recounted the day’s adventures to my husband who, after asking me how many jars of applesauce I’d be taking home, flatly responded: “That’s not much for two days of work. In two days you could make enough money to buy like 600 jars of applesauce.” I looked at him defiantly, wanting to shout, “Oh really? Checked my salary lately, have ya? ?” But every Dr. Laura show I’ve ever heard crept into my mind and I decided to take the high road. “What’s a Virginia Splitter?” he asked, interrupting me. “Fun? Yeah right! It’s hard work.” (At this point he didn’t need to know it was fun; I was building a case.) “It’s what women have done since forever, and I wanted to learn how to do it. It will taste so much better and be healthier for the kids…, ” My mind raced. What other virtues could I throw into this? “Oh, and I think once you own all the jars and stuff, it really is cheaper, and also I love the idea of taking advantage of all that wonderful fruit every fall…” My husband just shook his head. “Come on, Jen. You did it for fun. There is no other reason to can in the year 2010. We have children in third-world countries doing it for us, cranking out a can for a nickel every two seconds.” I could see his point. It is a great time to be alive on the planet. He went on. “It was a nice day to be with your friends, and I’m glad you had fun, even though you did lose your shirt on that Virginia Splitter.” I looked at him blankly. Did he still think we were talking about logging instead of canning? For the duration of our walk, I made a private game out of trying to get Derrick to say “Virginia Splitter” as many times as I could. I got up to five before he began to suspect something sinister. We made our way home as I anticipated the scene that would follow after sharing my labor of love with my family. Oh, the nutrients they would receive from those fresh Washington apples! Oh, the love my children would feel, crafted out of their mother’s own bare hands. The memories we would make, talking and laughing over Mother Nature’s rich bounty. The Robert Frost poems that would fill up the cracks of our family psyche like the smell of burning wood on a deep autumn’s day. How I would savor every bit of it, knowing my hours of hard work were well-served. “Hey kids! 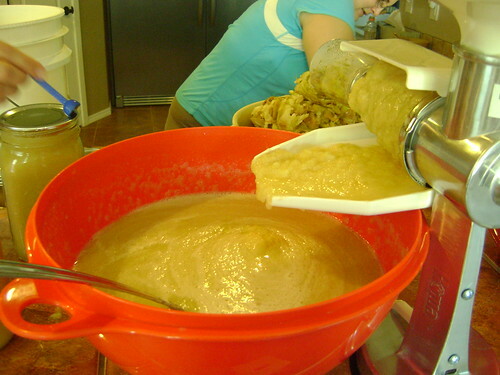 How about some warm, homemade applesauce?” I greeted them with bright eyes and a hopeful smile. “Kids? Applesauce? I made it just for you…” Still nothing from the girls, but Ethan did lift his head off the couch where he was watching HSM3. “No thanks, Mom. I don’t like applesauce. Can I have a fruit snack?” At least he was polite about it. It was then I realized: I had no idea if my family liked applesauce. I don’t think we’ve ever really eaten applesauce, come to think of it. I probably should have factored that information into my rendezvous with Vicky S.
It’s now been two days since I wrote this post, and I’m suddenly aware that I haven’t even unloaded the applesauce from my minivan yet. I’m not sure why. The canning actually looks pretty fun and really, really delicious. Now, to answer the epidural question, yes, I had a baby without an epidural and it’s the same logic behind wanting to run a 1/2 marathon or full marathon–cause you’re just a little bit crazy! Send some canning vibes my way, now I’m feeling guilty. I don’t know how many hundreds of quarts of applesauce and tomato sauce my dear sweet pioneer-stock husband has run through our strainer in our 30 years of canning. If you’re looking for the top-of-the-line strainer, try the Squeezo strainer — even better than the Victorio Strainer. all metal, but expensive. Ours is still going strong and we love it– except when it’s time to clean it! I think canning is so satisfying because you can go look at your shelves of jars and know that no one undo all your work in one day– like laundry and cooking! Have been looking all over the web for a Victorian Strainer like the one you pictured of metal construction for some time. The only ones I have found are made of plastic. Can you provide the company and phone # or their web site address please. Good for you! I enjoy canning it takes me back to my childhood with my grandmother. I still do mine pretty old school. peel and core the apples boil them on the stove until soft and then I strain them through a sieve. Then I recook them add some sugar and spices and can em up! Your device looks like it would work well for tomatoes as well 🙂 Happy Canning! This is so funny Jen! You know I’m with you on the epidural thing. Is there really glory in natural child birth? Nay. (Although the natural child-birthers will tell you differently). But canning, that’s serious grown-up stuff. off the subject – Any chance you could just scrap the new house and start building down here? oh you’re HILARIOUS. we’ll take some applesauce from ya! Oh my gosh, I’m laughing my head off right now. I know it’s not cost-effective but my family LOVES my canned applesauce so it’s totally worth it. By saying “my canned applesauce” I made myself sound like a seasoned canner. The truth is I’ve made it once. At someone else’s house. With someone else’s Virginia Splitter. But it was delicious (I actually hate applesauce) and my kids ate it like candy. Ignore Derrick, the perpetual cynic, and can on, my dear sister. Can on.